LEAD ON to a bright future. Fort Worth, Texas, is the 16th-largest city in the United States and a part of the vibrant Dallas/Fort Worth metroplex. Bloomberg Businessweek and Forbes rank it in the top 10 for finding a job. There are 21 Fortune 500 companies based in the metroplex, including ExxonMobil, American Airlines, and Toyota’s US headquarters, where many of our students gain internships. TYPE OF School: Texas Christian University is a private coeducational university. TCU is affiliated with but not governed by the Disciples of Christ. Pre-professional programs in Law and Medicine are available, along with the Honors College and study abroad opportunities in more than 65 places around the world. 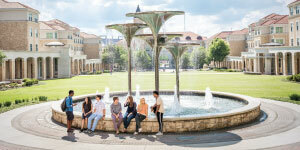 FINANCIAL AID: TCU offers merit scholarships to high academic achievers. For need-based financial aid consideration, submit the CSS/PROFILE (cssprofile.org) by February 1. US citizens and permanent residents must also submit the FAFSA (fafsa.ed.gov) by February 1. 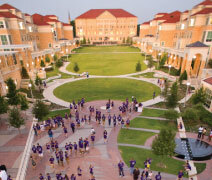 Texas Christian University is a place where students learnhow to adapt to whatever the future might bring, develop critical-thinking skills, and forge new paths.With career advisors in every academic division and four out of five students achieving internships, Horned Frogs are primed for professional success and personal achievement after graduation. The TCU academic culture is rigorous while nurturingcreative and in- tellectual thinking within a friendly, inclusive community of support. This is an education in which people are the priority. The TCU experience enables our students to broaden their intellect, their beliefs, and their values—the qualities most needed for leadership in a rapidly evolving environment. Whether in the fine arts, business, or engineering, Horned Frogs can discover their passions and expand their talents. Professors love being in the classroom, and teaching, mentoring, and connecting with students are top priorities. The investment professors make in their students provides a university experience infused with confidence and capability, care and ethics, intelligence and perspective. That personalized environment extends to the laboratory as well—thesame professors conduct cutting-edgeresearch, often with undergraduates at their side. Horned Frogs learn, live, and play on a 291-acre “green” campus where all new construction is LEED-certified at the Gold or Silver level, highlighting TCU’s commitment to sustainability. The Campus Commons is the heart of the University—home to the University union, residence halls, and academics. Across University Drive, facilities in the new Intellectual Commons are technologicallyadvanced and media rich to complement TCU’s state-of-the-art classrooms and laboratories. 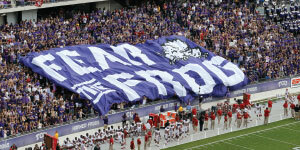 Students find a sense of community and belonging here, as TCU spirit is shared by everyone. When not in class or studying, they can work out in top-of-the-line recreation facilities, catch Big12 NCAA athletic competitions, and choose from more than 240 cocurricular organizations—all without ever leaving campus. Of course, Horned Frogs also have opportunities to make the world their stage. Students might practice journalism in Washington, DC; take on international business in Beijing; perfect their Spanish in Seville; or internin New York City and Los Angeles. Other students may choose to find something closer to home in the Dallas/Fort Worth metroplex, which was ranked by Forbes as one of the best places in the country to get a job after graduation. TCU is a dynamic up-and-cominguniversity. For seven consecutive years, the University has ranked in the top 100 in U.S. News & World Report’s national university rankings. The Chronicle of Higher Education has chosen TCUas a “Great College to Work For” for seven consecutive years. No matter the discipline or area of study, TCU prepares global leaders with excellence, perspective, and integrity to become a force for the greater good.